Psychology students at The Sixth Form College, Solihull developed an understanding of criminal behaviour recently by attending a Crimiknowledge Conference. 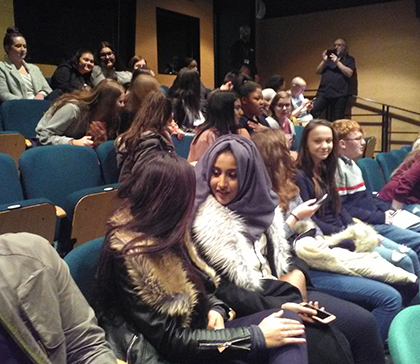 First and second year A level Psychology students attended this full-day event, which involved talks from a range of experts including Professor David Wilson, who talked about offender profiling and illustrated his ideas with clips from TV programmes he had presented. The topics included criminal behaviour both in and out of prison and ways of dealing with youth crime in Birmingham. Another speaker was Noel ‘Razor’ Smith who recounted his experiences of borstal (a youth detention centre) in the 70s and how the treatment there affected his later criminal behaviour as a bank robber. The event touched on employability skills, as students explored the various ways in which people with psychology degrees could work in and around the legal system. One talk was from a youth worker who explained how he used his knowledge of Psychology and Sociology to help young people who are in situations which encourage criminal behaviour to find ways to cope with the pressures they face. In particular he referred to modern forms of youth culture spread through the internet which glorify the positive consequences of crime in amateur music videos. Another talk was about how the field of Psychology has contributed new ways of helping victims of crime feel that they have achieved a positive outcome from the justice system. This is called restorative justice and it aims to help both parties understand the human nature of the crime by having the victims and the offenders mediate a restitution agreement. The mediator involved has to have a high degree of skill in managing the expectations of those involved as the meeting of victim and offender is emotionally charged. Although difficult, this form of justice is pursued because it leads to the highest rates of victim satisfaction and also offenders report they feel more accountable for their crimes because of it.